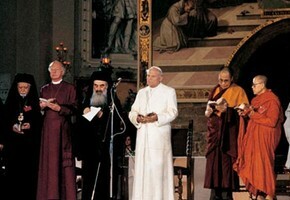 In 1986, Pope John Paul II invited the leaders of the world's major religions to come together in the town of Assisi (Italy) to pray for peace. Seventy leaders or their representatives accepted his invitation. He called this occasion the Spirit of Assisi because it was in Assisi that St. Francis of Assisi was born and lived much of his life, and St. Francis is one of the great peacemakers. On 27th October, 2011 which was the 25th anniversary of the Spirit of Assisi, Pope Benedict XVI hosted a similar gathering. Each year on 27th October, people the world over are invited to hold similar events to pray for peace. whether they are believers or not.